PDF is among the most popular type of documents used in businesses, due to the fact that they can be locked for editing and accidental changes. Searching for a specific word, phrase or string of words and numbers in multiple pdf documents though can be quite a nerve-racking experience. If you are using Windows 7 or the newer versions of Microsoft’s operating system, you must know that it is set to index only Microsoft Word documents into the search index of Windows Explorer by default. This means that, you may need to manually change the indexing settings if you need to search for a text in many pdf files. This can be done by accessing the Indexing options in the Control Panel, then choosing Advanced, and marking the file types you want to be added to the automatic search indexing of the Windows search. 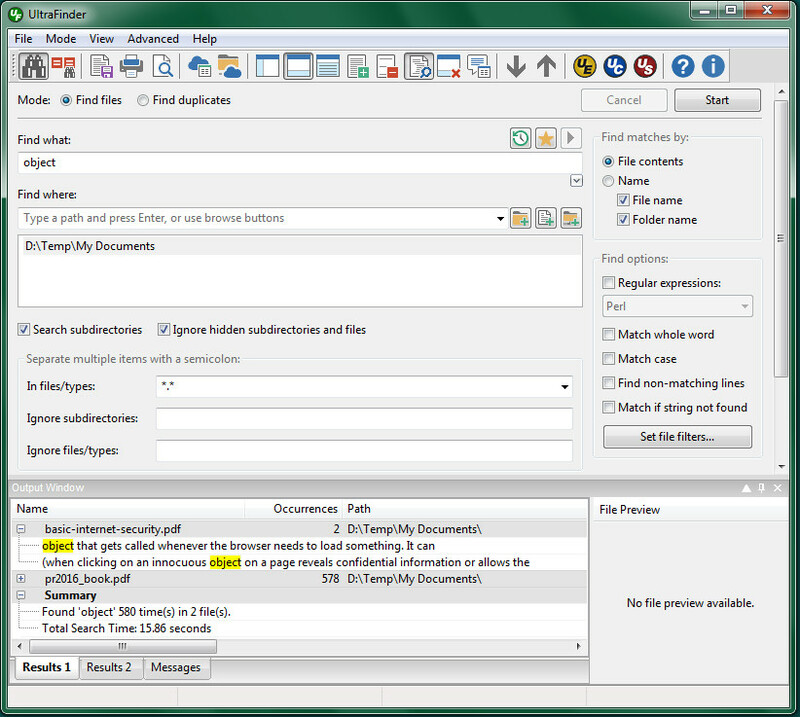 Pick pdf and click OK.
Another method for searching multiple pdf files is to use Adobe Reader’s advanced search option. 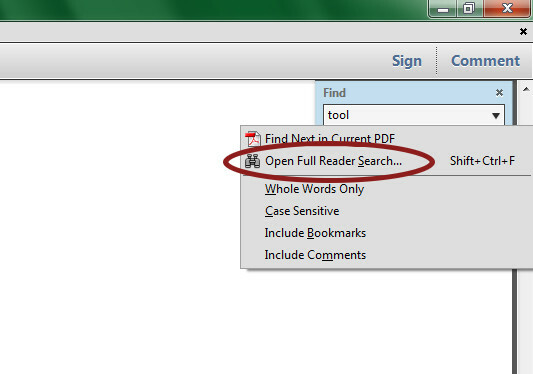 Open Adobe Reader and press Ctrl + F, a search box will pop out in the top right corner. Either pick “Open Full Reader Search” from the drop down menu, or press Shift + Ctrl +F and the Advance search option will appear. 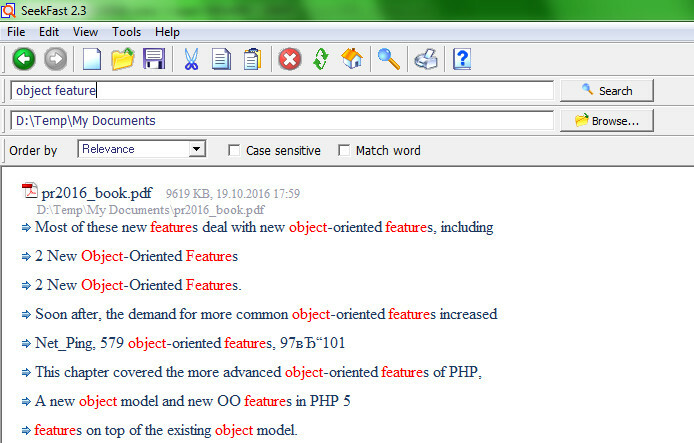 Enter the word or phrase you are looking for in the search box, and then choose the All PDF Documents in option. Pick the folder or entire directory or computer you want searched. This search even gives you an option for a case sensitive search, as well as whole words only, bookmark and comment search as well. If you want an easy, fast and efficient way to perform searches of the files of your computer, you should definitely try out SeekFast. This is a search tool which can search for a certain word or phrase in nearly any file on your computer, including PDF. It is quick and very user friendly. It will display the top findings in accordance to the relevance of the files found. It will also allow you to quickly preview each file to see whether it is the one you are looking for. You can easily integrate SeekFast into your Windows Explorer options, and when you go to a particular folder or directory you want to search, you just need to click on the right button and SeekFast will appear in the menu. So no more opening and closing each pdf file by file to find the one you are looking for. Just enter your search query, and the best results will almost directly appear on your computer screen, saving you time and a lot of effort. Foxit Reader is a shareware PDF-related tool, which will easily allow you to quickly search through multiple pdf files, which is especially useful when doing academic research, which requires finding resources in volumes and volumes of information. UltraFinder is a powerful shareware search tool which can search one or multiple drives and folders for a specific text or text string among all of the pdf files in them. The results are displayed with the sentence they are found in, for easier location of the exact file you need. Main inconvenience of UltraFinder is that it is relatively slow.